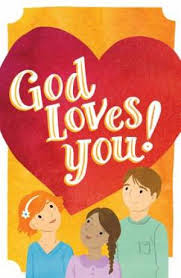 Petersham Bible Book & Tract Depot: God Loves You! You mean God loves the whole world? Yes! Here are three wonderful things about God's love. 1 God loves all people in the world– that means you too! He wants you to be his child and enjoy his love forever. But now your sins– the bad things you do– separate you from God. Because God is holy, he must punish all sin. How can I get rid of my sins? You can't. But God has already done it for you. 2 God sent his only Son to earth for you! Jesus Christ, God's Son, died on the cross to take away your sins. Three days later he arose from the grave and now he lives in heaven. Can I become his child now? 3 Yes, if you will receive Jesus as your Savior, he will take away your sins and you will be God's child forever! For God so loved ____________________ that he gave his only Son that if ________________ will believe in him, _____________ will not perish but have eternal life.